This is not an intervention. Guys. Hey guys. Guys listen. I think I have a problem. A shirt problem. Guys please. This is difficult for me, okay? It's been one year and one month since I bought my first T-shirt off the internet. Before that, I didn't own any. Now, I own ten. There is another one in the mail. That means that I buy just under one shirt a month. At about, say, $20 each, that's two hundred bucks I've spent on shirts. Back-converting to hours of work, that's 10 hours of my life spent earning shirts. One hour per shirt. But some of them were presents. 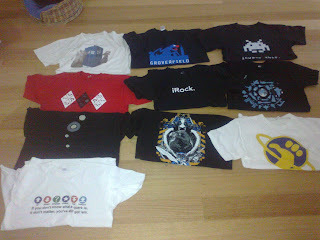 And some of them were those free-custom-shirt offers, so they were only like five bucks. Which is under a hundred total. So that's really only about half an hour per shirt. Actually, that seems quite reasonable. I think I'll go buy more shirts.